Home > Television > How Can I Get Digital Television? You might not actually want digital television but with the government intending to complete the digital switchover and turn off the current (analogue) television signal by 2012 you unfortunately don’t have much choice. There are essentially four ways of getting a digital signal which we will cover here. Converting or replacing your television and other equipment so that it works with a digital signal is covered in another article in this section. The first is the simplest and easiest and is often known as freeview, but note (confusingly) that you can also get freeview through a satellite (see below). Hence it's often referred to as terrestrial freeview or terrestrial digital. This is received through an aerial that's very similar to an ordinary rooftop aerial but better quality. They are usually known as 'high gain' aerials. If you are very close to a transmitter and have good line of sight to it you might be able to receive freeview programs with a standard aerial. If you think it might work you can always buy the set top box first and then get a new aerial if the quality isn't good enough. As well as a new aerial you will also need a set top box to receive and decode the digital signal. Many televisions sold nowadays will include a freeview tuner but check before you buy. The signal for freeview is not good in many parts of the country and there are websites where you can put your postcode in and see what reception is likely to be like in your area. Again check this before you buy, otherwise you will need to use a different method. Satellite television is already very popular in areas where ordinary television reception is not very good, and those areas are less likely to get a decent terrestrial digital signal too. 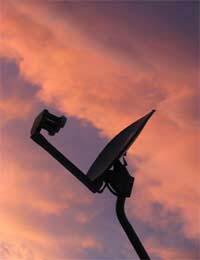 Satellite systems can be bought as a whole package from the UK satellite broadcaster, or you can set up your own system and watch freeview channels through a satellite. Most places where you can buy these systems will install them for you or give you comprehensive instructions. The BBC has been promoting freeview through satellite under the FreeSat brand, presumably to make people aware that there is an alternative to the other company that dominates the market. Cable is only available in the areas that were cabled up in the street-cabling frenzy of the late 1980s and early 1990s. Now that the cable industry in the UK has consolidated there is (with a few local exceptions) only one company you can buy services from. They will connect you to the cable network and you can get television, telephone and Internet services through it. Whether or not you chose cable depends on availability and price. It's less susceptible to weather disruption than satellite but occasionally programmes or channels disappear because of disputes between broadcasters. The last mechanism for delivery of digital television services is over the telephone line or, more specifically, a broadband connection. Note that this is different from watching television over the Internet on a computer. It uses a decoder attached to the telephone line which connects directly into your television. At the moment there is only one company offering this service on a national basis and contractual issues limit much of the content that the service is allowed to show. However, if it becomes popular, other broadcasters may take it up as telephone lines, unlike cable and satellite, are installed in virtually every home in the land. Footnote: this article has been written with respect to houses. If you live in a large block of flats where there are centralised services you may need to get the leaseholder's permission to put in a satellite or cable system. Check with them, or the management committee if there is one, to find out what the options are.